Item is a photograph of the Fina Station in the town of Louisbourg. Item is a photograph of the Fortress Inn in the town of Louisbourg. Item is a photograph of a photograph of a group at the Louisbourg waterfront. 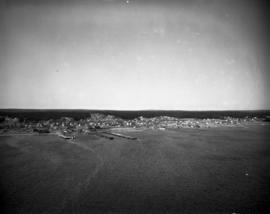 Item is a photograph of the Irving Oil Station in the town of Louisbourg. Item is a photograph of two photographs of lobster factory workers at Kennington Cove. Item is a photograph of the Louisbourg Restaurant in the town of Louisbourg. Item is a photograph of the Steylen's Garage in the town of Louisbourg. Item is a photograph of the Tartan Tea Room in the town of Louisbourg. 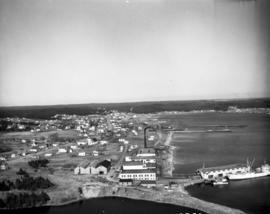 Item is a photograph of a photograph of the town of Louisbourg, showing coal pier.